One of the holiday triggers that is very common around this time of year is gift giving. The stress of finding the “perfect” gift for a friend, loved one or even a casual workplace get together can feel overwhelming. Which is why being mindful about our gift giving can be a powerful practice. By focusing on how we want to feel when gifting, that intention can bring a level of thoughtfulness and joy that will naturally begin to translate to the gift. Here are just a few guidelines I like to keep in mind when it comes to mindful gift giving and help us enJOY the season. Gift with purpose: Identify socially responsible businesses that give back or have a business model that balances purpose and profit. One of my favorite brands right now is Bombas. Not only are these socks the comfiest (and stylish) socks I’ve ever owned, but the company was started to make an impact on communities in the U.S. and for every pair purchased, they donate a pair to someone in need. You can also check B Corp for a list of companies that keep purpose at the forefront of business. Get crafty: DIY gifts flex our creative capacity and ability to be present. While I am the least crafty person I know, I have recently found a love of baking as a nourishing and mindfulness practice for myself. While baking from scratch is noble, I’m from the school that mixes are just as meaningful. Brandless is one of my favorite shopping experiences and was started “with the intention of making better stuff accessible and affordable for more people.” They currently carry an impressive and delicious selection of gluten free baking mixes and with every online purchase, they donate a meal to people facing hunger relief via a partnership with Feeding America®. Feel good (literally): It took me awhile, but I am officially on the weighted blanket bandwagon. While there are numerous health benefits touted by the weighted blanket craze including reducing anxiety, improved sleep, and deeper states of calm and relaxation, I can attest that it simply feels amazing and I feel like I can literally feel my nervous system settling. This is a tangible and practical gift for the stressed out person on your list that will bring some immediate relief. Here is a helpful guide that includes recommendations. Give the gift of giving: Consider donating to a local charity or organization that aligns with your values in the name of a person. ACLU, Planned Parenthood, and of course the many meaningful organizations supporting cancer patients and caregivers are some of my go-tos. Give the gift presence: While willingness is key for anyone wanting to cultivate a mindfulness practice for themselves, there are some thoughtful tools that can gently invite people on the journey. I love the Lumenkind Mindful Marks created by my dear friend Natalie Glover. These are easy touchstones to bring some mindfulness into your everyday. And of course, you can always purchase a gift certificate for private coaching with me or to be applied to one of my online programs. Just contact me for details. 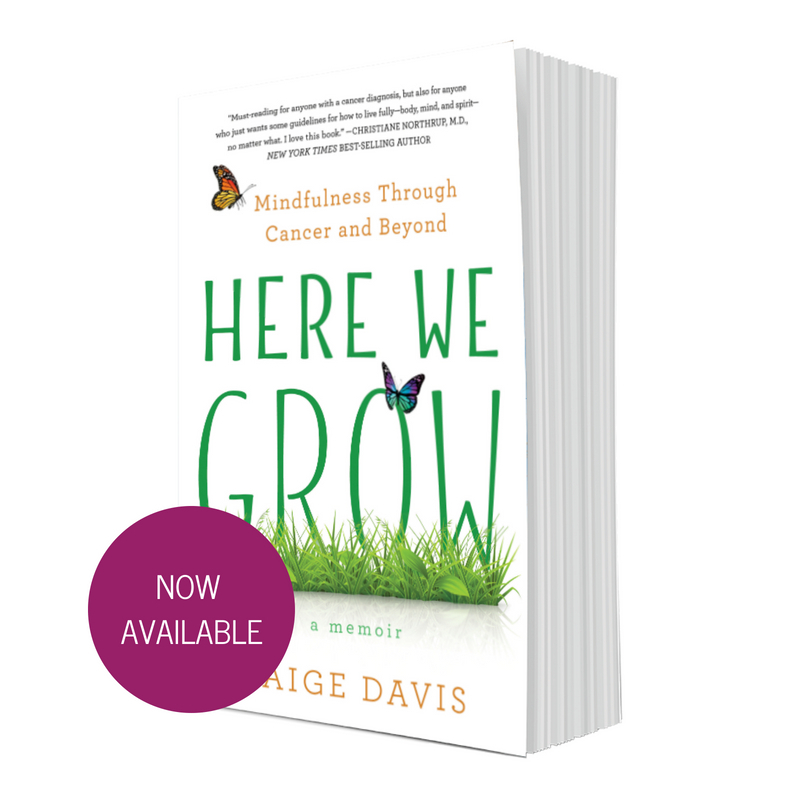 If you are looking for an unlikely holiday gift, this is a great time to pick up some extra copies of Here We Grow to have on hand to share throughout next year:-) As always, so grateful for your support. Wishing you all much love, light and delight! ps. 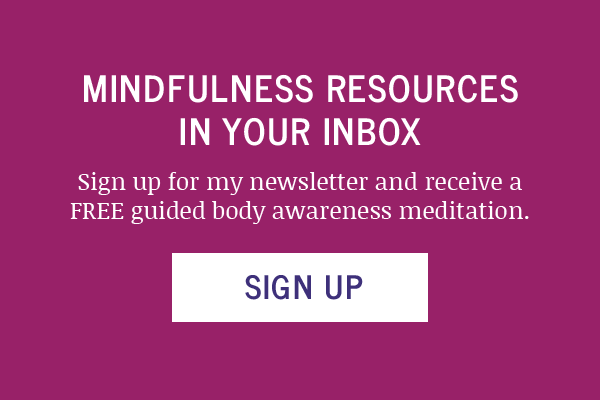 Sign-up for free access to my four of my go-to guided meditations to manage holiday stress here.